Yes, it has been perfect weather for making soup here in So Cal, which means it is probably soup weather in most of the country. Have you made a good soup lately? I would love to give it a try :] Post a comment below with a link to the recipe and I just may feature it. I found this recipe on EatingWell. Heat 2 teaspoons oil in a large saucepan or Dutch oven over medium-high heat. Add carrot (or bell pepper) and onion; cook 3 to 4 minutes. 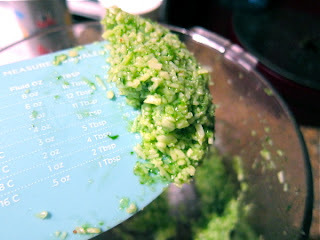 Add garlic and cook, stirring, for 1 minute more. 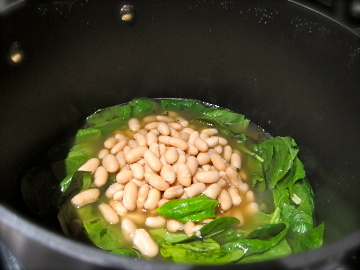 Stir in broth and marjoram (or basil & thyme); bring to a boil over high heat. 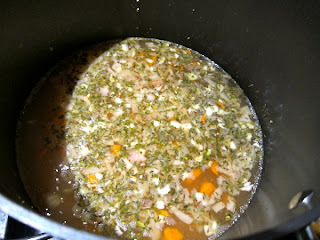 Reduce the heat and simmer, stirring occasionally. Combine the remaining 1 tablespoon oil, Parmesan and basil in a food processor. Process until a coarse paste forms, adding a little water and scraping down the sides as necessary. Stir the chicken and pesto into the pot. Season with pepper. Heat until hot. This soup is pretty darn good. And the best part? It's healthy! Per serving: 204 calories; 8 g fat ( 2 g sat , 4 g mono ); 29 mg cholesterol; 16 g carbohydrates; 18 g protein; 6 g fiber; 691 mg sodium; 529 mg potassium.